Chiangmai, a former capital of Thailand old Kingdom, is located 700 km north of Bangkok (1,600 km north of Hatyai). Besides being the biggest and most culturally important city in northern Thailand, it has in recent years grown into a prominent tourist destination. It has become an increasingly modern city and gained world attention when the Chiangmai Initiative was concluded here between ASEAN and China, Japan and South Korea. 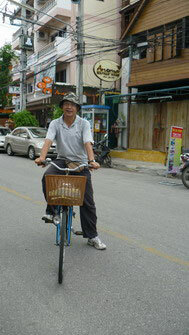 Photo: cycling (left) in the old walled historic site (top) to discover the relics of ancient times. 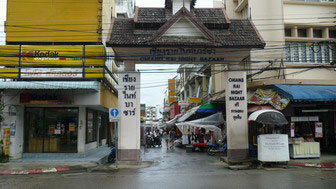 Chiangrai, Thailand’s northernmost large city is the capital of ancient Kingdom. 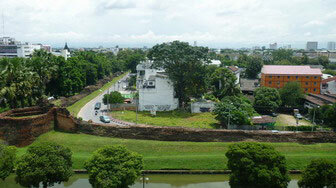 The city was once conquered and ruled by Burma (Myanmar) for several hundred years. 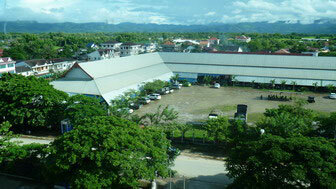 The city is located 860 km from Bangkok and about 200 km northeast of Chiangmai. 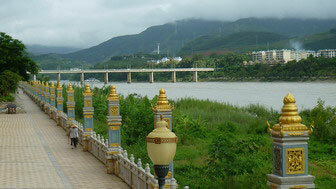 The Golden Triangle (bordering Thailand, Laos and Myanmar) is 55 km northeast of the city. Photo: the night market, one of the tourist attractions in the city, offers souvenirs, local products, cultural performances and variety of restaurants. Chiangkhong, located 137 northeast of Chiangrai is a gateway to Laos and China: by boat to Luang Prabang (ancient capital of Laos) and by bus from Houayxay (after crossing the river) to Boten at the Laos-China border. Houayxay is the endpoint town of the road, which connects the border with China at Boten, 226 km northeast. There are regular flights to Vientiane and Luang Prabang; luxury cruisers for tourists and other boats also run to Luang Prabang and other destinations. Fourth Thai-Lao Friendship Bridge: 480 meters long, is scheduled to complete in December 2012. The other three are located at Nong Khai / Vientiane, Mukdahan / Savannakhet and Ubon Ratchathani / Pakxe, all stretching across the Mekong River. Photo: taken at Houayxay; Mekong River can be seen at the far end with Chiangkhong on the opposite side of the river; the Laos immigration post is located on the river side at the end of the slope. Luang Namtha is located in northern Laos and is 50 km from the border with China. It is a popular trekking and biking tourist attraction, fresh air and amidst greenery environment with all the qualities to become a cultural and eco-tourism destination.. With the completion of the new bridge linking Chiangkhong (Thailand) and Houayxay (Laos) across the Mekong River this sleepy town of less than 3,500 (2004) people is expecting to draw more tourists and trading activities in the near future. 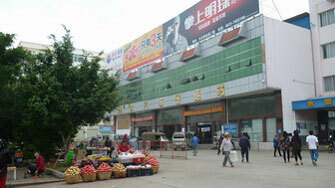 Photo: a central market scene, taken from Royal Hotel, a five-storey hotel, the largest here. 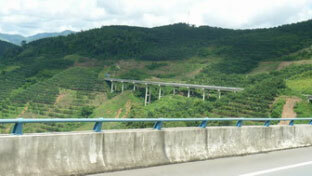 The Kunming-Mohan Expressway forms part of the Kunming-Bangkok Expressway. 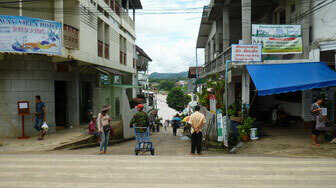 Mohan is the border town in China with Boten on Laos’s side. From Mohan it traverses through jungle and highlands before it reaches the new Houayxay / Chiangkhong bridge. 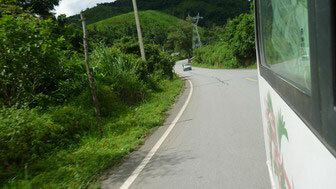 It then continues southward along Thailand Highway 1 until its reaches Bangkok. The expressway is about 1,900 km in length. Photo left: Mohan (China) immigration checkpoint; top: the existing road from the border to Houayxay (Laos) / Chiangkhong (Thailand) border. From Mohan to the next destination, Jinghong, Yunnan. China is capable of building expressways, bridges and tunnels with highly advanced technology. This expressway (see photo) that connects Mohan and Jinghong passes through many bridges and tunnels over high altitude. Lancang River passes through Jinghong with two bridges connecting the city (see photo). The river flows southeastward entering Laos, which then known as Mekong River and passes through Thailand, Cambodia and enters South China Sea near Ho Chi Minh City in southern Vietnam. The water festival, held in April each year, is the New Year celebration for the local and has become a main tourist attraction. Other attractions are the botanical parks and gardens. 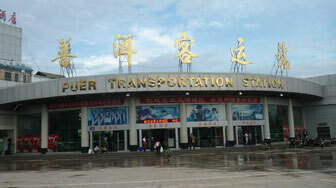 The city has the largest public transportation facilities in Xishuangbanna. The Yunnan-Burma Route, intensively used and supported by overseas Chinese during the Second World War, passed through this city. Located at an altitude of 1,300 m, Pu’er is a prefecture-level city in southern Yunnan that shares international borders with Vietnam, Laos and Myanmar. It gains much publicity as it is the original production area for the Pu’er tea, which contributes much to economy of the area. This tea is a Chinese specialty and is sometimes referred to as dark or black tea, recognized through the colour when serving. Pu’er is 397 km southwest of Kunming and 298 km from the border with Laos (Boten). Jianshui is located 217 km from the border with Vietnam (Lao Cai) and 67 km north of the Red River, which flows southward passing Hanoi (Vietnam) and enters Gulf of Tongking. It is a historical town with early human settlement about 3,500 years ago. The town was the economic, cultural, religious and political centre during the Ming, Qing. There are many historical sites including the Confucius Temple, which rank the second well preserved one after that in Shandong. Hekou, a border town in southern Yunnan and sits at the Red River bank with Lao Cai in Vietnam on the other side of the border. 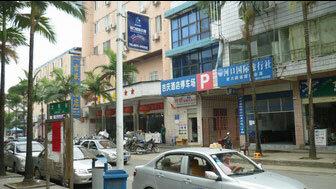 Hekou is strategically located with cross-border railway, waterway and expressway facilities. The town serves as an important gateway to countries in ASEAN and vice versa. The China immigration building is located near the riverbank. 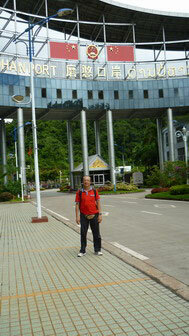 You need to walk across the bridge to enter into the Vietnam immigration checkpoint. From here you take a motorbike / taxi that brings you to the railway station. Sapa District is located in Lao Cai province Sapa town is a quiet mountain town and lies at an altitude of about 1,650 m. It is the home to several ethnic groups. The Catholic church here and the many buildings that were destroyed remind visitors and the locals as well of the War and the French colonial rule in the past. 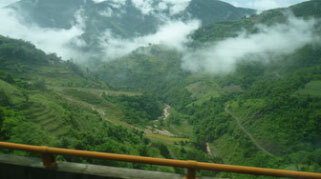 Sapa is now in full economic boom especially from tourism. The scenery here to a great extend reflects the relationship between the people and the surrounding nature. Unlike the so called modern society, which many a time go against nature, the local here are mindful to make full use of the gift of nature in their livelihood in cultivation. They choose to adapt to the nature where and when possible rather than going against it. There many high risen buildings outside the railway station, all newly completed, apparently taking advantage of the free trade economic activities with the opening up of the market in China and ASEAN. 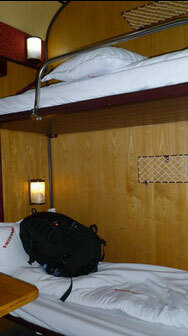 The train journey from Lao Cai to Hanoi, about 380 km, takes about 8 hours.